Marketing is a very broad term that that can shoot your anxiety levels through the roof, or get you pumped for every chart, graph, and Instagram post. Each business has a different relationship with marketing – and that’s completely OK. Whether or not you enjoy every day marketing tasks, you should leverage any local marketing channels available to you. Local marketing establishes a strong foundation on which prospective customers can find you. Also, local marketing can be a lot of fun! It’s a way for you to connect with your community and meet other local businesses and potential new customers. Although the Internet is a gigantic network, local marketing and your local community still has its own little spot. A natural place to start is creating a Google My Business profile (GMB) for your business. This profile is free, and allows you to provide all your business info to Google in an official way. Your business name, address, phone number, hours, website, description, photos, etc. can all be managed by you in a single dashboard. This ensures that your information is accurate and current. Your customers can also leave reviews, which has become critically important to establish trust and “social proof” before new customers decide to do business with you. Geo-targeting allows you to target specific people based on their physical location. If you want to find potential customers in your local area, or in an area that your business serves, you can use geo-targeting to do that. When advertising on Google, Facebook, Instagram, Twitter, or any number of other directories, search engines, and social media platforms, posts, images and ads can be targeted to your audience by IP Address, Physical Address (the user would need to share their location with you), Zip Code, neighborhood, or a geo-fence (a pre-determined distance from a point on a map). So, if you wanted to show ads for all users that live within a 20 mile radius of your local business, that is certainly possible. Other marketing tools great for local businesses are directory listings. Sites like Yelp, YP.com, Foursquare, Yahoo, and Bing allow businesses to provide local-specific profiles, listings, and ads. Providing information that’s specific to a local search allows your business to target the right audience. It also helps the user to search for things like “day spas near me that are open now”. One of the best ways to get in front of a local audience is at community events. Street Fairs, “Shop Local” Events, Farmers Markets, Church Events, Fireworks Shows, Sporting Events, etc. may be a great way to reach out to your local community. Some events may allow you to purchase a table or booth to talk about your business, sell your products, or simply have a presence. Local sponsorship opportunities may be available by sponsoring (and naming) a local sports team, hanging a banner at the local baseball or football field, or donating a prize basket to a charity event. A nice way to combine your online and offline marketing efforts is through local influencers and publications. These outlets are geared specifically to your local community. Local magazine and newspapers may have online and offline content available, and influencers (local celebrities, prominent social figures, etc.) may partner with businesses to promote goods and services they trust and enjoy. Give your customers a reason to bring a friend next time they come in to visit. You can offer BOGO discounts (Buy-One-Get-One-FREE) offers, or other group discounts. Plus, it allows a customer to become an influencer by recommending your business to their friends. There’s nothing better than being “that person” who turned someone on to their new favorite cafe, a trustworthy automotive mechanic, or the best new clothing shop in town. 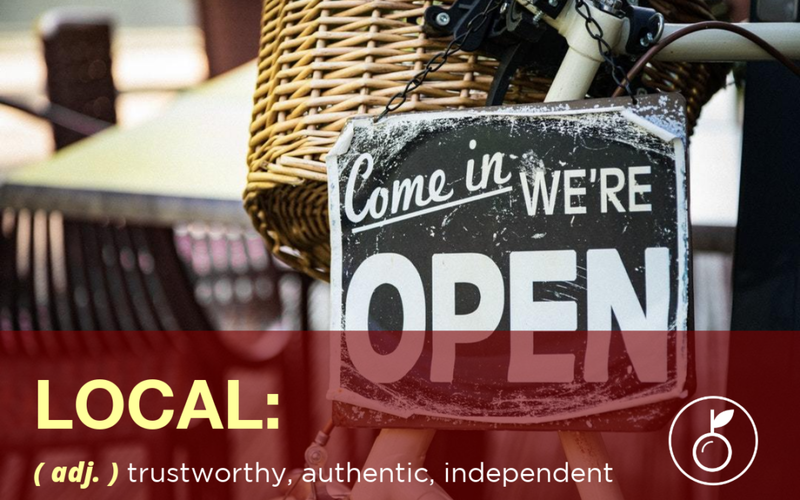 In recent years, the word local has become synonymous with trustworthy, authentic, and independent. It is important to embrace these qualities, and back them up by becoming a truly valued member of your local community. Your business will thank you!